Canoe alongside the magnificent Davidson Glacier, on the adventure of a lifetime. Your Skagway tour will start aboard one of our custom-designed vessels, as you explore North America's deepest fjord looking for whales, eagles, sea lions, and scores of other wildlife species. Next comes a beach landing at Glacier Point, where you will breathe the clean air of Alaska's pristine remote wilderness. 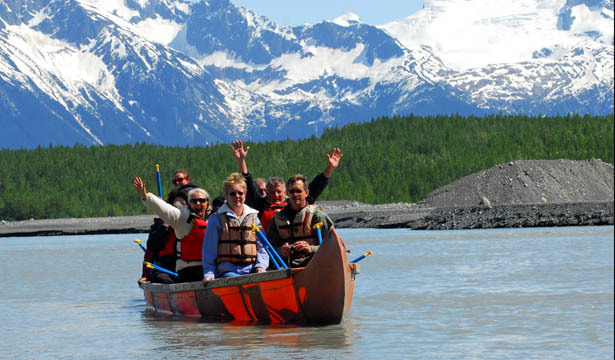 Your 31-foot canoe will take you near the glacier and around some spectacular landscape, as your guide helps bring the natural history of the area to life. Life jacket and boots provided before your canoe ride. Jacket and camera recommended. Meal or light snack provided depending on time of day you take the tour. You must be in good physical condition to take this tour, and be able to hike 1/4 mile over natural terrain. Guests must be between 50 and 350 pounds.